Click each button to the left to learn more. This section is a collection of research compiled by an multinational group of anthropologists seeking to foster the development of the discipline in Baja California, promote closer communication and cooperation between researchers, disseminate accurate information, and encourage an appreciation of and protection for the peninsula’s unique cultural heritage. The objective of this section is to provide tools that will assist researchers and students in their investigations of the aboriginal ceramics of the southern California region. The discussions of research issues are arranged under five general headings. “Chronology” deals with questions relating to prehistoric events and the broad-scale patterns of regional change. “Functions” addresses the uses that can be ascribed to specific kinds of prehistoric artifacts, features, and sites. “Resources” considers issues relating to the prehistoric exploitation of particular faunal, floral, and mineral resources. “Spatial Relationships” looks at spatial patterning in the prehistoric record, extending from the narrow scale of activity areas within individual archaeological sites up to broad regional or interregional systems. 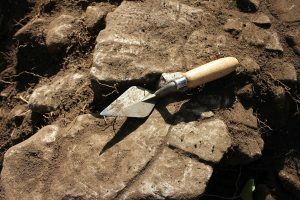 “Methods” raises problems of archaeological methodology. The groupings are fairly loose. Many of the topics relate to more than one of these general subject areas. We appreciate your support of collections-based research at the Center. Please make a tax-deductible donation to the San Diego Archaeological Center’s Annual Fund for Collections. You will have made a valuable contribution to our community, as together we preserve and share a past that is uniquely ours. To make your donation, please contact Executive Director Cindy Stankowski at cstankowski@sandiegoarchaeology.org.